I love the month of July for so many different reasons. At this time of year we're enjoying very warm weather, rain showers, lazy weekends, barbecues, vacations and the bounty of summer gardens. Gatherings with family & friends always seem extra special, and mine have been a lot of fun this month. This year, I was fortunate enough to have spent an entire week with my extended family in California which was rather nice. The weather out there was gorgeous, the food was delicious and the laughs seemed endless. Although there was a flurry of activity at my parent's, I still managed to spend quite a bit of quality time with some of my favorite people at cafes, restaurants (the only time I ever go out to eat! ), parks and shops. My main objective of that visit, however, was to spoil my niece whom I adore immensely. I must say that my mission was accomplished! A few delicious Good Things were shared this month, like that batch of delicious sugar cookies or the raspberries from our home mixed with a bit of thick, tangy yogurt. A lovely set of Martha by Mail cookie cutters were displayed for you collectors out there and I finally managed to show you how I keep my mixers super clean at all times. Some scrumptious nibbles made with pie crust are great when you have that small amount of leftover pastry, but I do caution you: they're addictive! Let's not forget the lemony rice salad that my family enjoys with or without tuna or those spicy, savory black beans that make vegan or vegetarian (also gluten-free) meals a cinch to put on the table. With August just around the corner, why not take a quick look back at July? This tender dough is the type of cookie I enjoy making. I love cookies of all types, but I especially love those that are quick to make either in the stand mixer or the old-fashioned way, by hand. There are times when I absolutely have to eat a fresh-from-the-oven cookie with a cup of tea in the afternoon, so the faster a cookie can be made & baked, the happier I'll be. 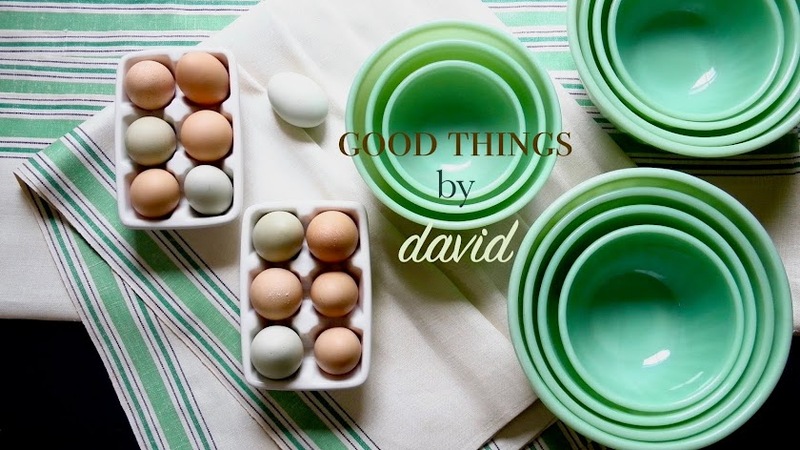 This is a porcelain dish holding a few of my soft sugar cookies. They each get sprinkled with clear sanding sugar (colored sugars can be used, of course), either coarse or fine, right before baking. 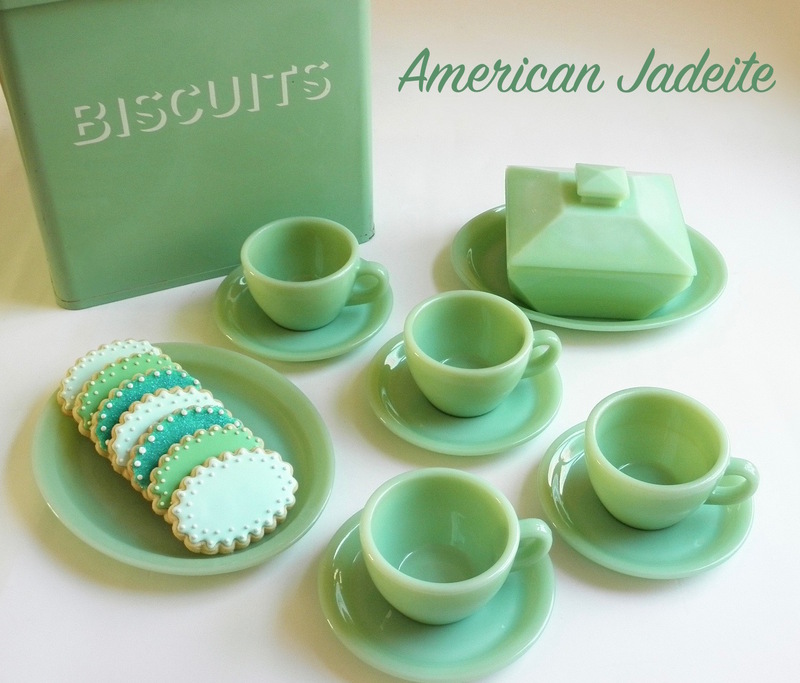 I just love this photograph of the cookies sitting on one of my jadeite plates. Sparkly and fragrant, the cookies are definitely worth making several times a year, especially around the holidays. If you do make them for a specific holiday, sprinkle the cookies with an appropriately colored sanding sugar. Everyone is going to want them! This post was a bit long overdue. It came as a result of one of my readers who had a bit of trouble with a batch of The Best Chocolate Chip Cookie. Remembering a few tips when baking, such as proper measurements, temperatures, and the correct baking sheets is extremely helpful when we want excellent results in the kitchen. Note: these cookies are thin & crisp on the edges, while chewy in the middle. I do have another recipe for chocolate chip cookies on the blog which makes soft & cakey cookies, so don't confuse the two. Some like soft & cakey chocolate chip cookies, and some only love thin & crisp. You may think to yourself this is a bit of a no-brainer David and you may be right. But, it is important to know the areas of a stand mixer which tend to get the dirtiest. I should know, I use mine every week. The last thing I want to do is walk up to one of my mixers and find a splatter of dough or butter or whatever on it. I just don't like working that way. My soft, 100% cotton towels from the former KMart line, Martha Stewart Everyday, are very useful in my kitchen. I wipe down just about everything with these absorbent towels and keep a few fresh ones in my kitchen at all times. A Professional KitchenAid 5qt. stand mixer with an enamel coated paddle attachment is clean and ready to get put away. The area behind the arms (if your mixer is a lift-bowl model) does tend to get flour stuck in there very easily, so move them up & down to release any particles when you're cleaning it. I'm spoiled with these raspberries. I look forward to picking them at the beginning of July when they pop open and are perfectly ripe. I always walk with a basket in hand, lined with one of my kitchen towels so that they don't get crushed as I pick. If I'm not making a dessert with them, then I enjoy them as is. Just look at the color! Definitely not the type you'll find at the supermarkets. This sun-kissed batch was still warm from being outside and a few were so ripe that they simply disintegrated in my hands. I wasted nothing. Eating the berries with some sweetened Greek yogurt is out of this world! I love enjoying this little snack in a teacup. Since it's a rather small serving, a Wedgwood Drabware cup is just the right size. The raspberries almost seem jewel-like. On a different day, I photographed the serving in a white bone china cup. The contrast in colors here was rather striking. Here's a closeup of the pick me up. Do try it with your favorite summetime berry if you haven't done so already. I reposted this entry the day I flew out to California because it was actually an activity I had done the day prior. I've said it before and I'll say it again, it's always nice to walk into my kitchen and see shiny pots and pans when I return from a trip. This is how they're currently stored against a wall in my kitchen. They're all within easy reach. I love pie crust. I love eating every single flake of it if I'm having a good homemade pie, so whenever I have leftover pastry from pie baking, I make these nibbles. There's no reason to throw away all of that deliciousness and although I do encourage sharing, I tend to keep these to myself. We're allowed to enjoy the fruits of our labor aren't we? So buttery & flaky. What's not to love? Another set of gorgeous cookie cutters from the former Martha by Mail catalog. Made of solid copper, the cutters are extremely collectible. I hope the readers out there who do own these are using them throughout the year, because they make beautiful cookies. One of my favorite antique stores in the Los Angeles area is King Richard's. Do I regret not buying these jars? Yes & no. Although they are unique and beautiful, I already have plenty of storage jars. Maybe someone reading this post will end up getting the pair. If you do, make sure to clean them thoroughly and oil the lids properly to prevent them from splitting. Look at the salt cellar on the lower right hand corner of the photograph. There is a horn spoon inside it and I completely missed the implement until I was going back and reviewing my pictures! I should have purchased it. I do regret leaving these mixing bowls behind. The Robinson Ransbottom trio would have looked lovely in my kitchen. I had to include a picture of this shelf filled with tupperware, not because I collect it (I wouldn't dare! ), but because I remember mom using it in our kitchen when we were growing up. Storage containers, bowls, jugs and jars were definitely in heavy use at home when I was a kid. I can still picture the green jello sitting in one of those bowls. This yellow jug always had some iced tea in our refrigerator. It seems like only yesterday! I'm not one who dreams about vintage kitchen ranges, but this O'Keefe & Merritt model really stayed with me. It's in pretty good condition considering its age. Another old range (I'm not sure the make or age), with some enamelware, spice jars & jugs surrounding it. Do visit King Richard's if you ever find yourself in Los Angeles. If you're a collector, you're going to love it. We can never seem to get enough of this rice salad which has been in my repertoire for many years now. As I said in the post, I sometimes include the best American pole caught tuna or some wild Alaskan red salmon in it. Play with the types of vegetables in the salad and make it your own. It's refreshing and very good when feeding a crowd. I do recommend that you use ingredients that are ripe & fresh when composing the salad. Remember, freshly squeezed lemon juice for the vinaigrette. Never use bottled! What could be easier than combining these ingredients in a pot and cooking them until tender? A hearty meal without the stress of having to do too much. Serve the beans with some steamed rice, along with your favorite vegetable for a complete meal. Here's to many more good things in August. Enjoy your summer! Belated happy birthday wishes to you David. It looks like you had a busy July and I hope you had a wonderful day on Saturday. I have been loving your posts, although don't think I have left a comment. I need to print out your post on cleaning the food mixer and then get to work on my Kitchen Aid - its clean, but I think it could be cleaner after reading your post! The cookies look fantastic. I haven't baked in a while but want to get back into it, I think this could be the perfect recipe. Here's to a wonderful August! 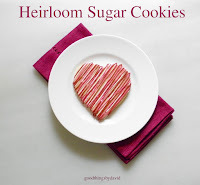 Do get back into the baking spirit and try those sugar cookies! You're going to love them. With the Olympics and all in London, you're probably mobbed with the throngs of people all over the place. I'm actually jealous, because it's probably very exciting! I'm glad you're enjoying the posts Pru and continue having a great summer!